We last left the Continental Congress a few weeks ago, having authorized the Continental Army and appointing its top commanders. Having shipped Washington and company off to war, Congress continued with its work overseeing prosecution of the war. On June 27, 1775, Congress reversed its position on having Allen and Arnold retreat to the south of Lake Champlain. Instead it authorized them to go on the offensive invade Canada. Three days later, Congress formally adopted Articles of War for the new Continental Army. The articles were pretty standard, banning bad behavior or desertion, and requiring officers and men to obey their superiors- stuff like that. Congress also authorized attempts to form alliances with Indian Nations, in order to prevent them from allying with the British. Around this same time, Congress received and condemned Parliament’s Restraining Acts barring the colonies from engaging in any trade with anyone outside the Empire. In short, Congress was getting everything onto a war setting with Britain. Even so, many delegates still hoped to end the war peacefully through negotiation. 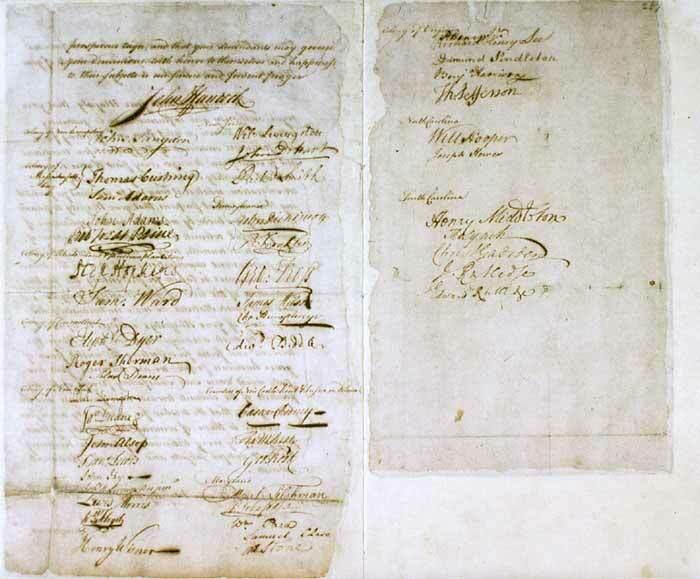 On July 5th, Congress adopted yet another petition to the King, known to history as the Olive Branch Petition. 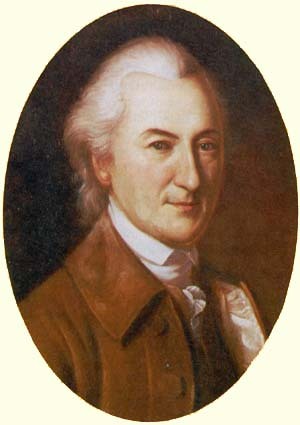 This was primarily the work of Pennsylvania delegate John Dickinson, though Benjamin Franklin, John Jay, John Rutledge and Thomas Johnson also served on the drafting committee. No one from New England served on the committee. Several sources indicate that Thomas Jefferson drafted the original version of the petition. I have found no basis for this assertion. Jefferson did not sit on the draft committee, did not even arrive in Congress until several weeks after the draft committee had formed. 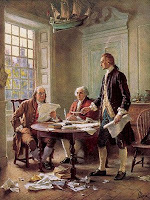 When he did arrive, he immediately set to work drafting the Declaration on Taking up Arms, that I will discuss next. It seems that some books are confusing the drafting of these two documents. While Dickinson had earned patriot street cred for his Letters from a Farmer in Pennsylvania, years earlier, Dickinson still clung to the idea that the colonies could remain attached to the mother country if only Britain would allow the colonies to control their own internal taxes. Dickinson’s views were still pretty radical back in 1767, when he penned the Letters. Now, even though his views remained the same, he sounded almost like a Tory. The petition itself avoided a long laundry list of the Parliament’s objectionable acts over the years. It stayed short and to the point. Things between Britain and the colonies had gotten crazy and now full scale war has started. This was the result of all the terrible stuff ministers were doing in the King’s name. It then humbly requested that the King use his authority to tell his ministers to respect the rights of the colonies and stop all this nonsense so everyone could get back to running an effective empire full of loyal thriving subjects. The petition still clung to the fiction that the King really was on the side of the colonies, and that the pesky Parliament or corrupt members of the ministry had somehow tricked the King into letting them deprive the colonies of their sacred rights. The petition implored the King to step in and settle everything by supporting the patriot view on taxes and individual rights. It’s not clear to me if anyone really believed that the King was being duped by his ministers. In truth, clinging to that fiction helped maintain their own fiction that they were not engaged in treason. It also gave British authorities a way to step in a create a negotiated settlement in such a way that would not cause the King to lose face. The petition itself only highlighted the divide in Congress between those who accepted they were at war and those who still clinged a hope to negotiate a compromise. The New England delegates considered the petition a waste of time. John Adams and Dickinson got into such a dispute over the petition that they stopped speaking to each other. Despite the disagreement, Adams and just about everyone else in Congress signed the petition. It did not commit them to anything and simply demanded the King gave them their rights. It evinced no view that the colonists would ever compromise on the issue of taxation or their right to create their own colonial legislation within their colonies. Even if many delegates considered it a waste of time, there was no use in creating bad blood with the moderates over a refusal to sign it. Along with the petition, Congress included an Address to the Inhabitants of Great Britain, drafted by Richard Henry Lee, Robert Livingston, and Edmund Pendleton. 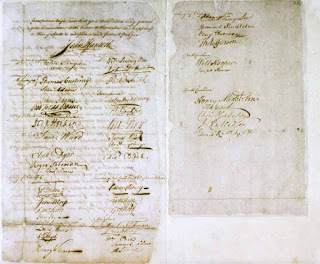 The King had refused even to receive the petition of the First Continental Congress. Probably anticipating that the King might treat its new petition similarly, Congress hoped the address would help build popular support for their cause in Britain itself. In the past, British commercial interests had effectively lobbied Parliament to abandon taxes and other colonial policies that had caused problems. Some in Congress hoped perhaps they could get local dissenters in Britain to help further the cause of the American colonies. Like the petition, the address made clear that the colonies were not seeking independence. Rather they sought to return to the way things were between Britain and the colonies in the early 1760’s. It noted that colonists were denied fundamental power to legislate for themselves or have basic due process protection. The Coercive Acts and the military occupation of Boston were only making the relationship worse. Parliament’s valid trade laws over the colonies profited Britain enough to justify the military and administrative costs that the British government incurred. Imposing additional taxes would only destroy what was already a highly profitable system for both sides. Congress clearly aimed this address at the commercial interests in England that it hoped would side with the colonies against Parliament. Congress sent the petition and the address off to London in the care of Richard Penn of Pennsylvania. It then moved on to other business. 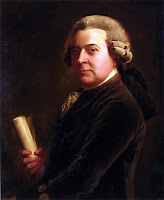 If the petition and address were not already a futile exercise, John Adams helped to make sure they were. Although Adams signed the petition in an attempt at colonial solidarily, he saw it as a danger. He feared the King might agree to the petition, bring an end to the hostilities, then let Parliament continue on taxing and restricting colonial rights. Adams had decided the time was right for independence, though he was not proclaiming that very loudly yet. He did not want to scare off the moderates. 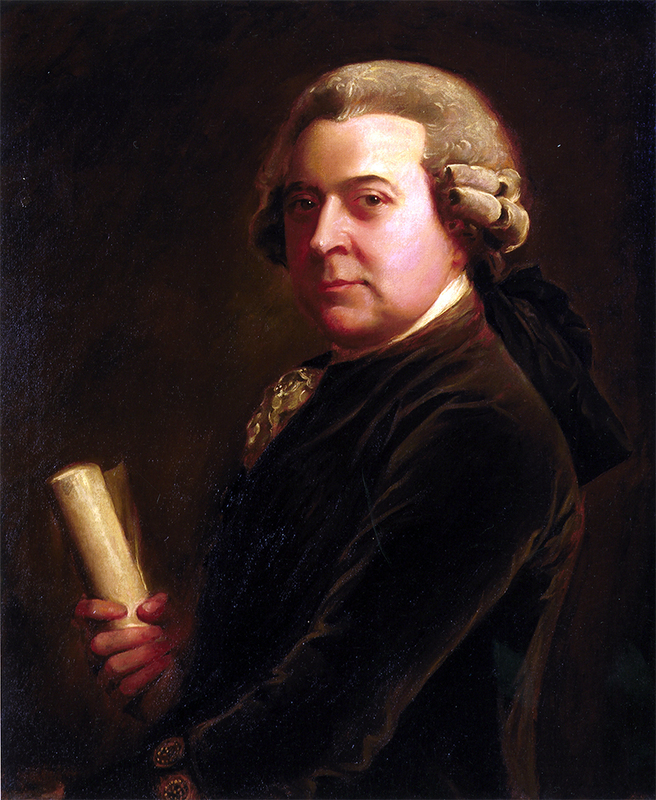 Adams wrote a letter to Massachusetts President James Warren. It discussed his frustration with debate over these documents when they really should be fighting a war. He expressed his hope that the King would reject the petition. 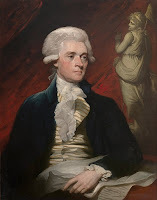 He called the petition a “measure of imbecility” and called Dickinson a man with a “great Fortune and piddling Genius” who was wasting Congress’ time with silly distractions when they would be better focusing on writing a Constitution. Someone stole Adams’ letter in transit and a Tory newspaper in Boston published it. This revealed to all that at least some in Congress were not really serious about pursuing a negotiated peace. It also helped to solidify the animosity between Adams and Dickinson, and confirmed the view of many in Congress that Adams was uncompromising, and kind of a jerk. The day after approving the Olive Branch Petition, Congress turned to approval of its Declaration on the Causes and Necessity of Taking Up Arms. Congress drafted the declaration at the request of General Washington. The original committee consisted of John Rutledge, William Livingston, John Jay, Thomas Johnson and Benjamin Franklin. The committee had almost the same makeup as the one for the Olive Branch Petition, except for the addition of Livingston and the absence of Dickinson. Rutledge worked as primary author of the first draft, which Congress rejected. We don’t have a surviving copy of that draft, so it is unclear what Congress disliked. To fix the problem, Congress added two more delegates to the draft committee: John Dickinson, and a newcomer Thomas Jefferson. Again, no one from New England sat on this committee. Thomas Jefferson had just arrived in Congress to replace Peyton Randolph who had returned to Virginia. Jefferson already had a good reputation as a writer, based primarily on A Summary View of the Rights of British America, which Jefferson had written the year before while still serving in the House of Burgesses. The First Continental Congress relied on that document as they were drafting their Declaration of Rights and Grievances. Beyond that, Jefferson was a relative unknown. He had served as a minor member of the Virginia House for a few years, but had not done much to make himself known. Jefferson also was not from a particularly prominent family in Virginia. He owned an inland estate, away from the wealthier tidewater region. His wife was a distant relative of the more prominent Randolph family. And whatever his social standing, Jefferson had a reputation as a good writer and dedicated patriot. With that in mind, Congress added him to the drafting committee. Jefferson based his first draft largely on his Summary View. I am guessing he borrowed liberally since he reported his first draft of the 13 page document the next day. There is no existing copy of this first draft, but many delegates found it much too combative. Jefferson spelled out many of the atrocities and infringements on American liberty that led to the current state of war against Britain and the colonies. Jefferson submitted his draft to the Committee. Dickinson began picking it apart, finding the language far too strident and combative for his liking. Eventually, the Committee got tired of arguing and told Dickinson to go work on Jefferson’s draft and bring it back to the Committee later. Dickinson made substantial changes to the language, softening its down, and making explicitly clear that Congress was not seeking independence, only the protection of its long held rights. Jefferson later noted that Dickinson only kept the last few paragraphs of his original draft. In fact, Dickinson kept Jefferson’s general outline and some language throughout, but definitely made substantial changes to most of it. The final document, in the end, received nearly universal approval in Congress. Even John Adams spoke approvingly of it. Congress printed copies to be distributed throughout the colonies, and to be read to the soldiers in the Continental Army. In preparing to go to war, Congress concerned itself with one other major source of power, the Native American population. The Six Nations of the Iroquois Confederacy had favored the British over the French in the wars of the prior 100 years. Generally, though, they preferred to remain neutral. Now, with Britain and the colonies going to war with one another, Congress hoped to encourage the Indians to stick to that neutrality. Congress’ address to the Iroquois was simple. They outlined the basics of the colonies’ dispute with England and suggested the Iroquois simply stay out of it. Congress feared British agents would stir up the Indians to fight against the rebellion. Congress simply wanted to make sure that did not happen. The Address to the Six Nations sought to open a dialogue with the Iroquois to ensure they would stay out of any fighting. With the petition, addresses, and declarations complete, Congress turned to some more practical measures, at least as Adams saw it, toward prosecuting the war. Washington was by this time, hard at work trying to create an effective Continental Army. Already Congress was struggling with how they were going to support that huge standing army that needed food, clothing, supplies, and ammunition. Congress further realized that fighting would almost certainly spread well beyond Boston, and could envelope all of North America. There was no way they could afford to expand the Continental Army to defend the entire continent. Congress decided to follow the Massachusetts example. On July 18th, Congress approved a call to form minuteman units in all of the colonies. Essentially they were putting the militia on high alert everywhere so that they could respond to an British attack or invasion anywhere. Minutemen would drill regularly and be ready to act as needed. In some sense, Congress was playing catch up here. Most colonies had already put their militia on high alert. Even Pennsylvania, which did not have a tradition of citizen militia, had formed a militia army months earlier and had been drilling and preparing its forces for a potential fight. Congress also quickly found itself overwhelmed and unsure how to control the new Continental Army. They had reasonable confidence in George Washington their new Commander in Chief, and a former delegate. But the fear of standing armies and their threat to civilian rule pervaded their thoughts. Without an executive branch, Congress had to maintain its own civilian oversight of the army. It retained all authority to commission officers. While Washington might make recommendations, Congress often appointed leaders that Washington did not want. It frequently made choices, not on military ability, but to ensure fair representation of each colony, or to provide benefits to friends and relatives. Many successful field officers like Benedict Arnold, quickly realized that battlefield victories did not lead to advancement. Armchair officers in Philadelphia, who could get the ear of a powerful delegate, had a much better chance of promotion. As a result, Arnold remained a colonel while men in Philadelphia received appointments as generals. Even generals grumbled about some appointments. Maj. Gen. Lee still wanted to be Commander in Chief. Gen. Heath became the superior of Gen. Thomas, even though Thomas had been Heath’s superior in the Massachusetts Provincial Army. But for the most part, this grumbling remained limited to letters to friends. Everyone wanted civilian control to work. Officers could not be seen publicly seeking more power for themselves. Aside from appointing officers, Congress actively involved itself in the day to day affairs of the army. It expected regular reports from Washington. Many other officers liberally corresponded with delegates in Congress on a wide range of military issues. Congress set up committees to deal with a variety of ongoing military matters. Congress also created a formal medical department for the army. Clearly if there was fighting, the soldiers would need medical care. As I mentioned last week, Dr. Benjamin Church became the first Surgeon General. Congress made clear from the beginning that it would not simply create an army and set it loose. Even placing congressional delegates among its top generals was not enough. The history of Cromwell, who started as a member of Parliament and ended up taking control of Britain and tossing out Parliament, remained in the minds of many delegates. They wanted to keep the army on a short leash, ensuring that it would always remain loyal to Congress and accept the continuing authority of civilian leadership over the army. 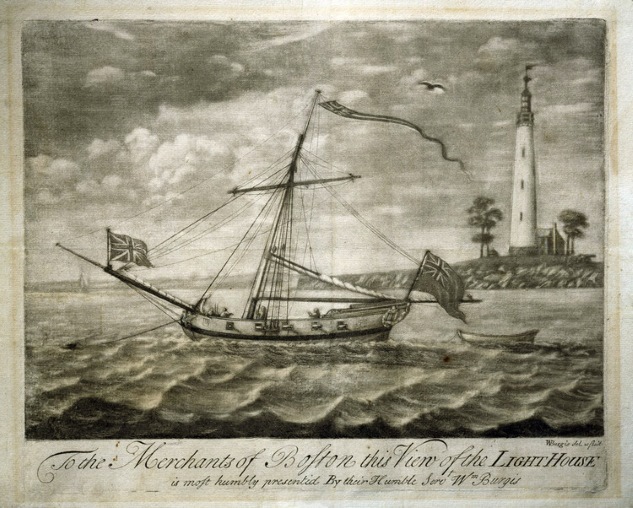 Congress hoped to improve communications in the colonies. The unofficial committees of correspondence had proven useful. But there needed to be a better system for sending messages around the continent, especially now that there was no British oversight of a postal system. Fortunately for America, the man in Britain who had worked on an American postal system for many years was none other than Benjamin Franklin. He has lost that post a year earlier after the Ministry exposed his revelations of Gov. Hutchinson’s letters to the patriots in Boston. But Franklin well understood the existing system and could continue to manage it. Congress made Franklin the new Postmaster General for the continent. Franklin would collect a $1000 salary and not do a whole lot more with the job. He remained a delegate to the Continental Congress, which still took up most of his time. He appointed several local postmasters and hired his son-in-law, Richard Bache, as his assistant. The following year, Bache would take over for Franklin as Postmaster General. Late in July, Franklin also began circulating ideas for Articles of Confederation. The Continental Congress really had no legal authority for its existence or anything it was doing. It needed a set of rules, guiding principles, and restrictions on its power if it wanted to continue. Franklin had been pushing for this sort of confederation for decades, going back to his support for the Albany Plan in 1754. His proposed articles called for making the Continental Congress a permanent body to promote common issues of defense, safety, and welfare. It also called on colonies to make payments to Congress based on their population. Although Franklin circulated the idea, the moderates in Congress recoiled at the prospect. Supporting such a measure could be seen as supporting a permanent independent government to replace Britain. Members were not ready to go that far yet. As a result, though delegates discussed the matter, they decided not to have any formal vote in this session. Congress would continue to run on an ad-hoc basis. The final issue on Congress’ agenda that summer was Lord North’s Conciliatory Proposition. You may recall back in February, Lord North sent a proposition to the various colonies to end all colonial taxes by Parliament. Instead, Parliament would issue a demand for money to each colony and allow the local legislature to raise the money however they wanted. Now this proposal had gone to the various royal governments in each colony. The Ministry did not acknowledge the Continental Congress, nor any of the provincial congresses that had taken control. All of the colonies had pretty universally rejected the idea of giving Parliament a blank check to demand as much money as it wanted, whenever it wanted, for any purpose it wanted. That just seemed like a bad idea to everyone. Even moderates like Dickinson could not support this idea. So, the Second Continental Congress took it upon itself to reject the Conciliatory Proposition and send the response back to Lord North on behalf of all the colonies. Congress had decided any peace would be on its own terms, not that of anyone in London. Two days later, on August 2, 1775, Congress adjourned for the remainder of the summer, planning to resume work on September 5th. Journals of the Continental Congress, Vol. 2 May 10-Sept. 20, 1775 Washington: US Gov’t Printing Office 1905. Chinard, Gilbert Thomas Jefferson: The Apostle of Americanism, Boston: Little, Brown & Co., 1944 (originally published 1929). Dickinson, John The Political Writings of John Dickinson, Wilmington: Bonsol and Niles, 1801. Morse, John T. John Adams, Boston: Houghton Mifflin, 1912 (original 1889). Stillé, Charles The Life and Times of John Dickinson, Philadelphia: Historical Society of Pennsylvania, 1891. Van Doren, Carl Benjamin Franklin, New York: Viking Press, 1938. McCullough, David John Adams, New York, Simon & Schuster, 2001 (book recommendation of the week). A few weeks ago, I discussed the Continental Congress’ decision to create a Continental Army and appoint George Washington as its commander in chief. Before Washington could take charge, the Provincial Army fought the battle of Bunker Hill that I discussed for the last two weeks. With the battle over, I’m going to pick up the story of Washington taking command of the new Continental Army. The Continental Congress had voted to create the Continental Army on June 14, 1775. 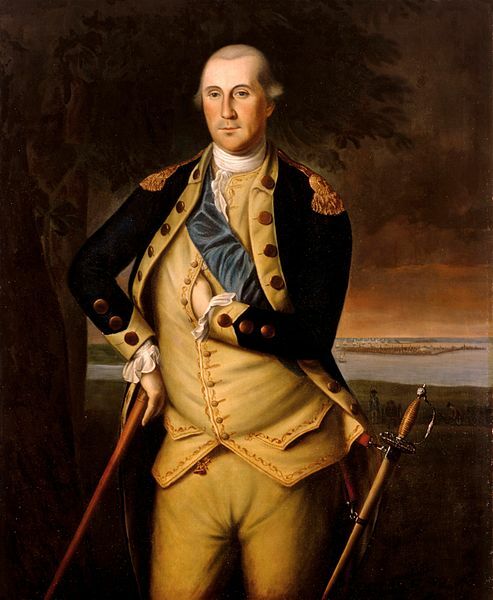 It appointed George Washington as the new commander on June 15, two days before Bunker Hill. Word of the new commander did not reach Gen. Artemas Ward until June 25, a week after the battle. Washington took a couple of weeks to prepare, get his affairs in order, and make the trip to Boston, arriving on July 2, escorted by James Warren, the new President of the Provincial Congress, and Dr. Benjamin Church head of the Massachusetts Committee of Safety. Washington first stopped to meet with General Ward, now the Continental Army’s second in command and the most senior major general in the new army. I’m not sure if Ward was offended or relieved to have a new commander. He did turn over command promptly and without public comment. If there was a chance the two might develop a good working relationship, Washington put an end to that over the next few weeks. Washington publicly criticized the lax command structure and leadership that he inherited, which Ward took personally. With Washington were fellow Virginians the new Major General Charles Lee, third in command of the new army and newly appointed Brigadier General Horatio Gates. As I mentioned last week, both men were in contention for the top job and both had been officers in the regular army before settling in Virginia. Connecticut General Israel Putnam, who had played a prominent role at Bunker Hill and most other events at the siege of Boston, also received an appointment as major general in the new Continental Army. The only major general not present was Philip Schuyler who was in Albany trying to resolve the military situation with Ethan Allen and Benedict Arnold out around Fort Ticonderoga (see Episodes 59 and 60). Two more Massachusetts generals in the Provincial Army were among the first eight brigadier generals appointed by Congress. Generals John Thomas and William Heath received their commissions. Generals Joseph Spencer from Connecticut, and Nathanael Greene of Rhode Island also both served in the Provincial Army and received commissions as brigadiers. In case you were wondering, the others in the first class of brigadier generals were Joseph Sullivan, a New Hampshire delegate to the Continental Congress, who would arrive a few days later, Richard Montgomery who was Schuyler’s second in command in New York, and David Wooster from Connecticut, the same man who had refused Captain Benedict Arnold access to the powerhouse in New Haven after the Battle of Lexington (see, Episode 59). These men rounded out the first class of brigadiers. Also with Washington were his new aide, Maj. Thomas Mifflin and his secretary Lt. Col. Joseph Reed, both from Pennsylvania, and both of whom will play prominent future roles in our story. At the risk of making too many introductions at once, I want to mention one more man accompanying General Washington. Billy Lee was Washington’s slave. He served as his personal assistant, valet, butler, and messenger. Washington had purchased Lee in 1768. The two men apparently grew very close. Lee was one of the few men anywhere who could keep up with Washington on a horse. Both men were excellent and daring riders. Lee would serve Washington for all eight years of the war, remaining by his side through everything. It is unclear if Washington ever confided in Lee, because if he did, Lee never betrayed that confidence. It was clear that Washington was close with Lee and appreciated his service. When Washington died, Lee was the only slave he freed outright. He also granted Lee a pension for the remainder of his life. I’ve already given some background on some of these new generals, and will probably need to provide more background on more of them in future episodes, but today, I just want to focus on Washington himself. Hopefully, everybody knows who George Washington is, and there are literally over a thousand published biographies about the man, almost all of which are better than this brief summary.. But in the interest of being thorough, here is a brief background. Washington was one of the earliest people I introduced in this story, way back in Episode 5. There, as a young man he blundered into the Ohio Valley and kicked off the Seven Years War between Britain and France, known in America as French and Indian War. In 1759, as the French and Indian War was nearing its end, Washington married Martha Custis, a wealthy widow with two children of her own. George, then 26, left active military service and got elected to the House of Burgesses later that year. For the next 15 years, he spent his time as a gentleman farmer and minor legislator, while remaining a Virginia militia officer. 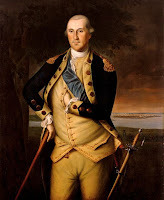 Washington had begun wearing his militia uniform to the Second Continental Congress, where he was a delegate. Some have argued he was angling to be made the new commander of the Continental Army. As I mentioned in an earlier episode, from the public and private statements of Washington around this time, I think he hoped to be made a general, but did not anticipate being appointed Commander in Chief. When offered the command though, he stepped up and accepted it. Washington was also an extremely formal, quiet, and reserved man. As a boy, he came from one of the lesser families in Virginia and was always focused on comporting himself more like the wealthier leaders in the colony. He focused obsessively on his dress, speech, manners, and behavior, and expected others to do the same. He rarely took anyone into his confidence or engaged in casual conversation. If anyone ever betrayed his confidence, even in a minor way, he would cut them off rather coldly and would not allow them to become close ever again. When Washington arrived in Cambridge, the southern officer experienced a bit of a culture shock with his new army made up of New Englanders. Washington had expected to command an army of over 20,000. The force that met him, however, had less than 14,000 ready for duty, which referred only to the state of their health, not whether they were really trained to fight in battle. The People of this Government have obtained a Character which they by no means deserved—their Officers generally speaking are the most indifferent kind of People I ever saw. ….. [T]they are by no means such Troops, in any respect, as you are led to believe of them from the Accts which are published, but I need not make myself Enemies among them, by this declaration, although it is consistent with truth. I daresay the Men would fight very well (if properly Officered) although they are an exceeding dirty & nasty people. He was shocked at the level of disorganization, that soldiers and officers did not respect the chain of command, and that blacks and whites were fighting alongside one another. He immediately began to try to change all these things. One of the things though, that helped make Washington great, was his ability to accept advice and to change his views when convinced of a better idea. Washington initially ordered the dismissal of black troops. As a Virginian he was raised with the concern that armed blacks created a risk of slave insurrection. New Englanders though, had no such fears. Free whites outnumbered both slaves and free blacks combined by overwhelming numbers. Convinced by his New England officers that dismissing the black troops was a bad idea, he soon reversed himself and permitted the racially integrated units to continue. He soon grew to admire and appreciate the capabilities of these men. His concerns about organization, deportment, and the chain of command though, required change. After personally inspecting the lines, and getting numerous reports on the state of his new army, One of Washington’s first actions was to hold several courts martial, to remove officers who had exhibited cowardice during the battle of Bunker Hill. He also took an inventory of his army, including men, arms, and supplies. He did away with the right of soldiers to elect their officers. All Continental officers would receive a commission from the Continental Congress. Washington knew that an effective army needed discipline. He issued rules against profanity, drunkenness, and gambling. Officers and men had to attend daily religious services. Violations could be punished with floggings. He ordered officers to improve the neatness and appearance of their men and the camps, keep their men from wandering away from camp without orders, and crack down on the destruction of private property. The new commander issued an order for sentries not to communicate with the enemy. Soldiers on the front lines at Boston Neck or Charleston Neck often stood within shouting distance of their counterparts on the other side. Such conversations were banned as was any correspondence with the enemy. Supplies were also a primary concern. Washington tried to get Congress to buy more shirts for his army. He really wanted whole uniforms but realized this was impossible for now. Many men had been wearing the same unwashed shirts for months, reducing them to rags. Washing them was impossible as there were no women around to do the work. Apparently, it was inconceivable that a soldier might wash his own clothes. New shirts would go a long way toward improving morale. Congress, however, could not come up with the money even for that. Instead of uniforms, Washington ordered his generals and aides to wear ribbons over their shoulders much like a Miss America sash. 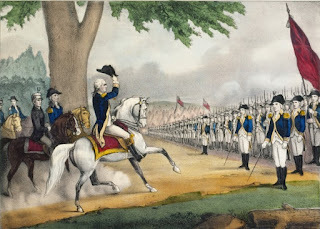 Washington wore light blue, his general wore pink sashes and his aides green ones. Field officers would wear colored cockades, a smaller ribbon tied in a bow, in their hats. Washington organized his army into three divisions, one for each of his major generals at Boston. 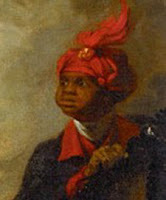 He put General Ward in charge of the the army’s right at Roxbury, defending Boston Neck. General Lee took charge of the left, which included the defense of Charlestown Neck against the British on Bunker Hill. Putnam commanded the center at Cambridge, under Washington’s direct supervision. Washington may have expected that the men in his new army would need training and discipline. What really shocked him was the lack of ammunition and supplies. Originally his aides told him the army had just over 300 barrels of powder, about enough to give each soldier a one full cartridge box, and not much more, not even counting the needs of any artillery. That count, however, was based on old paperwork. It had not counted all the powder that had been used over the past month, including the Battle of Bunker Hill. When his aides actually did a physical check on inventory, they found only 90 barrels for the entire army. When Washington heard the news, he apparently was struck speechless for some time. He realized he did not have enough to fight even one battle with the British. If the British attacked, his army could not fight back. Washington did not write any letters to Congress about this desperate shortage. He feared that if the enemy learned of this fact, they would march out of Boston and crush his army as they could not even return fire for very long. In fact, the British commander, Gage, did hear about the powder shortage. He still had his spy network including Benjamin Church, head of the Committee of Safety. Gage, however did not believe it, thinking it was an attempt to draw him out of Boston into battle. Washington made getting more powder a priority, but it would take months to get any significant increase in stock. He had to issue orders banning any firing practice or other unauthorized discharges in order to conserve what little powder they had. Also, to counter the lack of bayonets for most of his men, the army ordered the production and deployment of spears to defend against an attack. Even these were slow in coming. Disease also became more of a problem over the summer. Dysentery and smallpox swept through both the British and Provincial camps, killing or disabling many. At one point nearly 20% of the Continental Army was unfit for service. Hundreds of them would die that summer, without ever seeing battle. 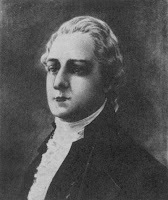 In late July, Washington appointed Benjamin Church as the head of a newly formed “Hospital Department” a position that would be referenced as “Surgeon General”. For the most part, the army seemed to accept its new commander and complied with his policies. It could all fall apart quickly though. Ward, his second in command soon took offense at Washington’s criticism of the condition of the army when he took control Ward knew that reflected poorly on his leadership. Lee, third in command, was still upset that Congress had not selected him as commander in chief. He seemed to be waiting for Washington to screw up, so that he could move into the top slot. Both men, however, bided their time and, for the moment, enforced Washington’s policies. Washington was eager to do battle with the British, but the condition of his army and the lack of ammunition made this impossible. Both armies remained well entrenched in defensive position, neither side willing to attempt to dislodge the other. On the British side, Bunker Hill seems to have taken the fight out of the British commanders. In July, they received reinforcements that more than covered their losses from the battle. But General Thomas Gage in particular seemed unwilling to initiate any new fighting. Gen. Henry Clinton had pushed to follow through on their original plan to take Dorchester Heights. His plan would bypass Boston Neck and launch assault troops for a water landing. Clinton got the plan as far as putting soldiers on landing craft. Gage, however, got cold feet and sent a messenger ship to recall the invasion before they could land. There were occasional skirmishes. In the days following Washington’s arrival, there were apparently several minor attacks and counter attacks near Boston Neck. 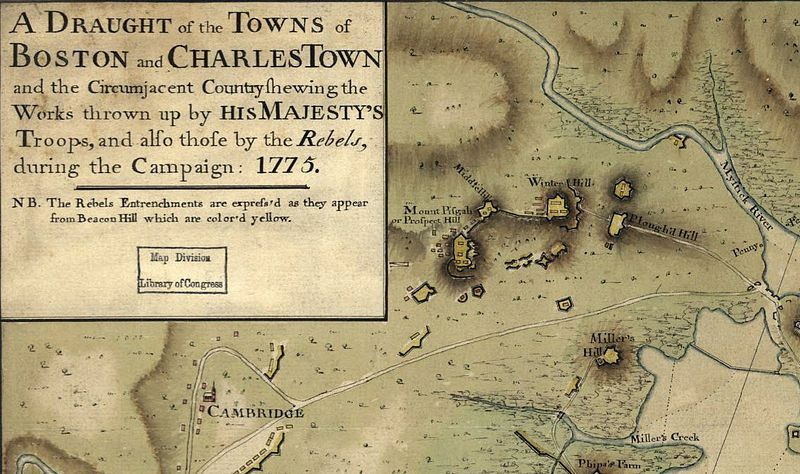 British troops attacked defenders at Roxbury, possibly in an attempt to capture some stray cattle between the lines. After that, Gen. Ward issued an order calling for any cattle straying beyond American lines to be shot. The Americans attacked and destroyed Brown’s Tavern, a small building on Boston Neck occupied by British regulars. The British would launch another raid a few weeks later, attacking Americans who were trying to reinforce and extend their defensive lines. The Americans would use the the distraction of this attack to launch a successful attack on the Lighthouse on Lighthouse Island, making night movements for the British Navy a little more difficult. 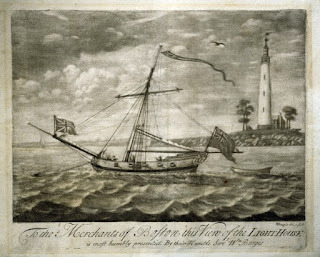 That night, the British sent a construction crew with 30 marines as guards to repair the lighthouse, They were still working the following morning when the Patriots launched another attack on the island, capturing the construction crew and the marines, and once again burning down the repaired lighthouse. The arrival of the new Continental rifle units from Virginia and Pennsylvania created new excitement. Riflemen liked to show off their skills by firing on sentries across the river in Boston. Somehow the regulars captured one of them. It’s not clear whether they captured him alive and then hanged him, or simply hanged his dead body after they killed him. Either way the hanging body appeared in Boston in view of the Continental lines on August 2. 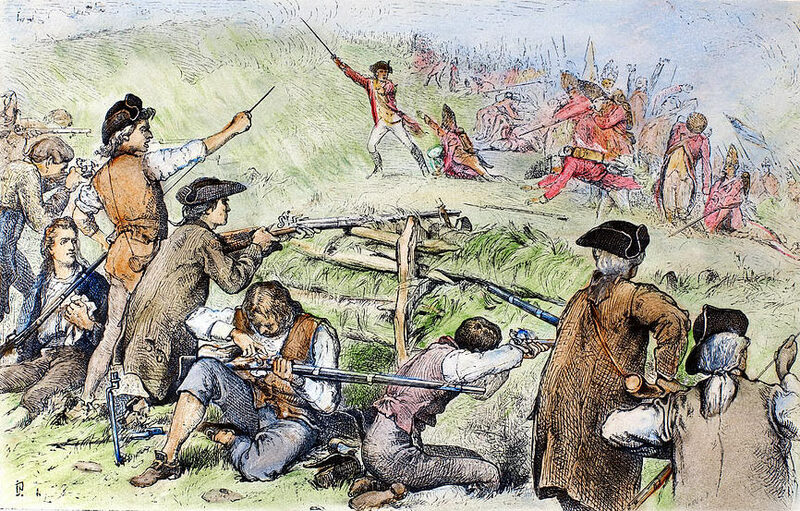 Enraged riflemen received permission to fire on regulars in Boston, which they did for the rest of the day, killing or wounding an unspecified number. British muskets could not return fire, but artillery could. One rifleman died from a well placed cannon ball. These are only a few examples of the ongoing small-time skirmishing that kept both armies on alert. A slightly larger skirmish occurred when on August 26, Washington ordered the occupation of Plowed Hill (aka Ploughed Hill), a small hill across the river to the north of Bunker Hill. Overnight, 1200 Continentals entrenched their position on the hill, giving them a good position across the river against the British on Bunker Hill. 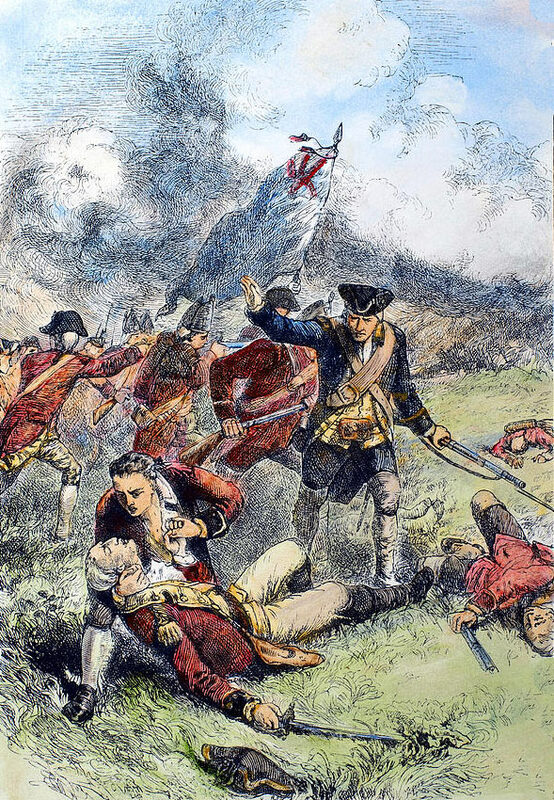 The next morning, the British opened fire on the Continental forces from Bunker Hill and several gunboats, but could do little against entrenched forces. They killed or injured a few soldiers who ran out of the bunkers to collect British cannon balls. Continental officers gave soldiers a reward for any balls they collected. A few soldiers tried to use their feet to stop balls slowly rolling across the field, only to discover that a relatively slow moving 20 pound ball can still do serious damage to your foot. The Americans had one cannon with them, which they used successfully to sink one small British gunboat. The British prepared to assault Plowed Hill by boat, but decided against it. Continental riflemen were already picking off too many of them. They did not want another costly win like Bunker HIll for land that they could not really hold if they took it. In the end, they simply left the Americans in control of the hill. So, the summer of 1775 ended with the stalemate over Boston showing no sign of ending. Heitman, Francis Historical register of officers of the Continental Army during the War of the Revolution, April, 1775, to December, 1783, Washington: Rare Book Publishing Co. 1893. Leiter, Mary Biographical Sketches of the Generals of the Continental Army of the Revolution, Cambridge: University Press, 1889. Linn, John, et. al (ed) Pennsylvania in the war of the revolution, battalions and line. 1775-1783, Harrisburg: Lane Hart,1880 (pp. 6-7 discuss Battle of Plowed Hill). Lodge, Henry Cabot George Washington, Vol. 1, Boston: Houghton Mifflin & Co. 1898. Chernow, Ron Washington: A Life, New York: Penguin Press, 2010 (book recommendation of the week). 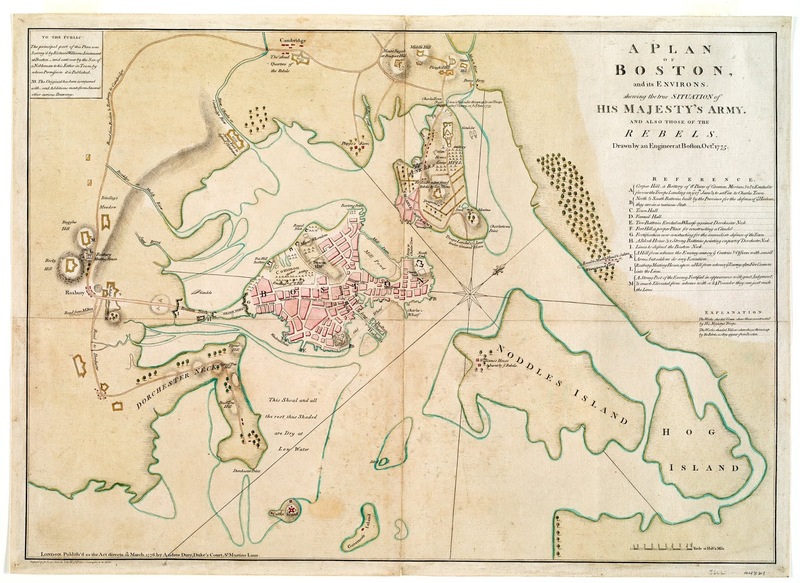 Last week, I discussed how the provincial army decided to occupy Bunker Hill, then actually occupied Breed’s Hill on the night of June 16-17, 1775. 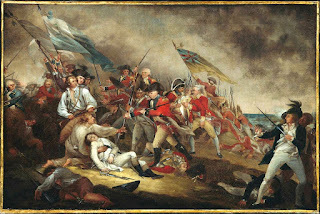 The next morning, the British under the command of Gen. William Howe crossed the harbor to land a force in Charlestown. They expected to push the inexperienced colonists off the hill and off the Charlestown peninsula. It took Howe all day to get his forces across the water and prepare for attack. He held back his forces until all of them, including his reserves, were across. Gen. Howe sensibly wanted to hit hard with all of his forces at once. The delay, however, gave Massachusetts Col. William Prescott, in command of the provincial forces on Breed’s Hill, more time to entrench and expand his defenses. He also had time to call for reinforcements, though those never came. Also frustrating was the fact that that Prescott really did not have command of all the forces. Prescott controlled the contingent on Breed's Hill where his Massachusetts militia had, build the main defenses. 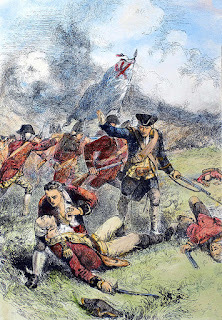 New Hampshire Colonel John Stark used his colonial militia to build a defense of the provincial’s left flank, but did not really coordinate his work with anyone else. Connecticut General Israel Putnam spent most of his day yelling at infantry and artillery on Bunker Hill, but not accomplishing much of anything else. The three separate groups, however, did manage to create a rather formidable defense. Each leader seemed to see the weaknesses left by the others and tried to fill in the gaps. Prescott held a strong fortification in the center. Stark built a surprisingly impregnable defensive line on the left flank, defending the line all the way to the water line. Putnam got the forces on Bunker hill, primarily artillery, to prevent an easy path for the British around Prescott’s right flank. By mid-afternoon, some time between 3:00 and 4:00 PM on June 17th Gen. Howe was finally ready to make his first advance on the provincial lines. Howe divided his force in half, leaving his second in command, Gen. Robert Pigot to begin a direct assault on Breed's Hill. Howe would lead the other half of his army against the right flank where General Stark and Captain Knowlton had thrown up breastworks. While the British had disembarked, Putnam had sent militia into Charlestown village where they took up positions as snipers in the building. Pigot’s men lining up for the assault took casualties from the harassing fire in the village. Howe approved Admiral Graves’ request to destroy the town. Graves opened up on Charlestown with hot shot (iron balls heated to the point where they would set wooden buildings on fire when they came into contact) and carcasses (combustible materials fired from cannon, designed to set buildings on fire). Graves also deployed a team of sailors with torches to complete the destruction. The effort quickly burned the entire village of several hundred buildings to the ground. The provincial snipers either burned or retreated back up the hill. The fire also contributed to the oppressive heat for everyone in the area. Howe, advanced at the front of his line toward the provincial’s left flank. Meanwhile Pigot advanced his troops directly against Breed’s Hill. Howe also sent several light infantry companies along the beach, trying to get around the provincial lines and attack from the rear. Howe’s planned attack quickly fell apart. The 330 light infantry sent along the beach should have been able to push through the 50 militia defending the beach. General Howe had requested that Admiral Graves position a ship to fire on the beach, but by late afternoon Graves could not move anything there to be of use that day. Militia typically would panic and fire early before the enemy was in range. Regulars could then charge their position and destroy them with bayonet. Col. Stark, however, had carefully instructed his men not to fire until the British reached a marker on the beach that he had laid out. 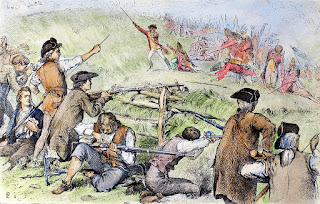 In doing so, the militia held their fire until the British were close enough to take a devastating volley. The British staggered back, attempting several more assaults, but given the thin strip of land, had to climb over their dead comrades, thus slowing their charges. They never were able to break the provincial line. Nearly a third of the British force lay dead or dying on the beach, with many more wounded. Stark’s American left flank held. Meanwhile, Howe and Pigot had their own problems advancing the main force up the hill. The fields around Breed’s Hill had a number of low lying fences, which farmers used to mark property boundaries. The soldiers stumbled to cross these fences in the face of enemy fire. Like Stark’s men, Prescott got his soldiers to hold their fire until the regulars were well within range, then unleash devastating volleys. He also used sharpshooters to pick off enemy officers at an alarming rate. Meanwhile, Putnam had found the cannons abandoned by his artillery, grabbed a few infantrymen, and gave them a quick on the job training in artillery fire. Soon, provincial artillery was firing into the advancing British lines with pretty effective results. Howe realized his right flank on the beach had failed to break the enemy lines. He now knew his main assault had to succeed. But the fire against the regulars as they attempted to get over the fences and reform their lines was too much. The regulars kept trying to fall back and reform lines before advancing again, but could not force their way into the redoubt. Soon hundreds of regulars lay dead and wounded all over the field, creating even more impediments for future assaults. Howe tried to order his field cannon closer to break the enemy lines, but the cannon got stuck in the muddy fields and could not get into position. Pigot’s direct assault on Breed’s Hill took fewer casualties, but also failed. Once he saw Howe’s line begin to retreat, he also pulled back to prevent the wholesale slaughter of the British left. Once the infantry pulled back, the artillery renewed its largely ineffective barrage of the provincial defenses. Meanwhile, Prescott’s men were exhausted. Most had been awake for nearly 36 hours, having built their defenses the night before. They were beginning to run out of ammunition, having only what they carried in their cartridge boxes. Prescott had maintained good firing discipline in the redoubt. The entrenchments had protected most of them from enemy fire. But desertion had reduced the redoubt to about 150 men. Most of them were out of ammunition. The officers found a few artillery shells and broke them open to use the powder in the muskets. Still, there were not enough musket balls. Defenders experimented with shooting small rocks or anything else they could fit down their barrels. Prescott kept waiting for reinforcements. The few companies that crossed Charlestown Neck, seemed content to observe the battle from Bunker Hill. They did not even bother to start a second line of entrenchments on that larger hill, in the event that the British overran Breed’s Hill. Only a single company of Connecticut militia serving under Captain John Chester joined Prescott in the main redoubt. This supplemented the line with only about 20 more men. The other person able to join Prescott was Major-General Joseph Warren, who had recently received his commission from the Provincial Congress while serving as that body’s President. Warren had spent the morning in Cambridge suffering from a terrible migraine headache. But he was determined to join the fight, despite the fact that everyone thought he was too valuable to risk on the battlefield. But Warren said he could not ask other men to risk their lives if he would not do the same. He wanted to be where the fighting was most dangerous. He acquired a musket and joined Prescott in the redoubt. Again, although he outranked Prescott, he left Prescott in command. Despite the abysmal performance by provincial artillery, they did provide Prescott with a little support. Captain Samuel Trevett was the only artillery officer that day to make a pretty good account of himself. He disobeyed Col. Gridley’s orders to remain off the Charlestown Peninsula and fire at the navy from the relative safety of Cobble Hill. Instead, Trevett brought two field cannon across Bunker Hill, past the redoubt on Breed’s Hill, and set up in the defensive fletches just to the east of the redoubt. From there, his crews could bring effective fire against the regulars trying to storm the redoubt. According to some accounts, General Putnam also convinced another artillery crew to move down from Bunker hill and set up in a defensive location just to the west of the redoubt. Although the inexperienced crews could not fire quickly, they did contribute to the fire against the regulars trying to take Breed’s Hill. As soon has the regulars staggered back to the shore, Howe began almost immediately reforming his ranks for a second assault. The regulars began their second assault right away, in hopes that the enemy would not have time to reinforce or reposition. The officers reformed the lines and made their second charge up Breed’s Hill. Because ammunition was running low, Prescott ordered his provincials to wait until the British were within 30 yards of the redoubt. Later retellings give the famous line “don’t fire until you see the whites of their eyes.” But given these accounts came much later, it is unclear if Prescott ever really spoke those words. Whatever words he did use though, Prescott got his men to hold their fire until the regulars were almost upon them. He then unleashed what became some of the most brutal and devastating fire of the day. The regulars tried to hold their ground and storm forward. But the provincials kept up a three line volley fire, meaning a line fired about every ten seconds, while the other two reloaded. Some British companies took 90% casualties. By one account, some regulars began stacking up their own dead to use as a defense against the withering fire. One American sharpshooter in a tree above the redoubt did his best to pick off officers with deadly accuracy. He had several men below him reloading and passing him a loaded rifle, allowing him to take shots with great rapidity. It is estimated that this one shooter alone took out about twenty officers before the enemy dispatched him. After about thirty minutes of brutal fighting, the British staggered back in retreat for a second time. One of the few regulars still standing on Breed’s Hill was Gen. Howe, who somehow found himself amazingly alive as everyone around him had fallen. Stunned by the repulse, Howe remained standing. The then slowly picked his way back down the hill, stepping over the hundreds of bodies that littered his path. General Howe had to accept that his first two attempted assaults were complete failures. The provincials had held their ground, contrary to all conventional wisdom. Further, his own regulars had been unable to keep lines or withhold fire until within range. He decided to make a few changes for the third assault. First, he finally got his artillery within range of the enemy lines. British grapeshot tore into many of the provincials outside and around the redoubt. Howe also organized his men into five columns rather than lines. Normally, marching columns into battle is a bad idea since a single cannonball could rip through most of the column. But the provincials did not really have any effective artillery. The few they did have were off to the sides. The columns left gaps between the soldiers so they could more easily get around impediments while advancing. He ordered his remaining exhausted and overheated regulars to remove their packs and any other encumbrances. Howe also ordered his soldiers not to load their guns. He did not want them stopping to fire and breaking stride. This would be a bayonet assault only. Inside the provincial redoubt, Prescott had more men now, but these were the men who had been protecting his flanks They had moved inside to get away form the deadly British artillery fire. 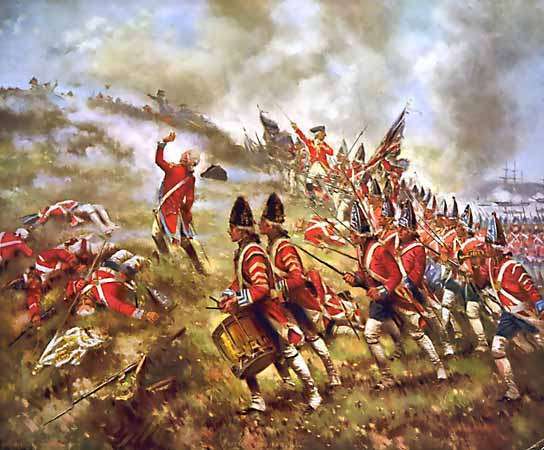 This time, Prescott ordered his men to withhold fire until the enemy was within 15 yards. The regulars got so close that many thought the provincials had finally retreated and had abandoned the redoubt. Instead, the provincials gave the regulars another deadly volley. The British took heavy casualties but continued forward, storming the redoubt shouting “fight, conquer, or die!” The provincials had killed most of the British officers, so confusion reigned. Regulars got pinned down behind the final wall as both sides continued to fire. One of the field commanders at the lead of the regulars was Major John Pitcairn, the same marine who had commanded the regulars on Lexington Green a few months earlier. Pitcairn desperately charged his marines into the withering fire, taking a mortal wound to the chest. Soon though, provincial fire slacked as they had no more ammunition. The regulars swarmed the redoubt, expecting the provincials to surrender or flee. Those provincials who had not deserted though, were the toughest of the lot. They continued fighting hand to hand, using their guns as clubs. Finally, Prescott and Warren called for a retreat. General Warren used his sword to fight hand to hand as the soldiers pulled out. Warren was determined to be the last man out of the redoubt. As the men retreated, Warren called for one last volley. At that moment a British officer’s aide pulled a pistol and fired, shattering Warren’s skull, killing him instantly. Just to be sure, a group of grenadiers bayoneted his body repeatedly. The regulars, angry at the high price they paid to take the hill, were in no mood to accept any surrenders, even if anyone even tried. The provincials took most of their casualties for the day during the retreat. 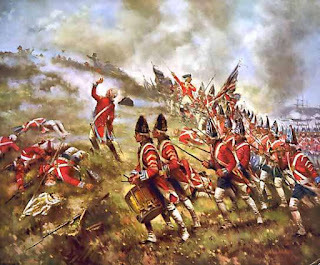 The British fired repeated volleys as the survivors ran across an open field, escaping Breed's Hill and moving up Bunker Hill. On Bunker Hill, Putnam attempted to rally a second line. But even he could not stem the panicked retreat over Bunker Hill and back across Charlestown Neck. Having captured the defenses on Breed’s Hill. Howe decided not to pursue the retreating provincials. His army was in disarray and most of his officers dead or wounded. It was now near evening. Gen. Clinton had crossed into Charlestown without orders, bringing even more reinforcements. But they were too late to engage. 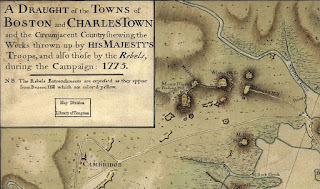 The remaining provincial forces retreated across Charlestown Neck back toward Cambridge, leaving the peninsula completely in British control. The battle was over. Bunker Hill is considered a British victory because the regulars successfully took the hill and took control of the Charlestown peninsula. But it was a costly victory. The British suffered more than 1000 dead and wounded. British officers took a big hit, with over 80 killed or wounded. If you don’t count Clinton’s late arrivals, that is nearly a 50% officer casualty rate. The Americans took about 450 casualties that day. Only about 30 were taken prisoner, and 20 of those died in captivity, likely due to serious wounds before capture. Although over 3000 provincials claimed to participate in the battle in some way, there were never even 1000 men opposing the British assault at any point in the battle. So as a percentage, casualty rate for the Americans who actually fought on Breed’s Hill was pretty high as well. 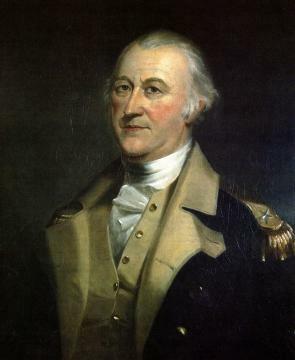 Gen. Gage had planned to take Dorchester Heights following the capture of Bunker Hill. But the casualty rates from the battle changed his mind. His army would occupy and entrench Bunker Hill, but would not attempt to take any more land from the Provincial Army. The most painful loss for the provincials was the death of Gen. Warren. James Warren would replace Joseph Warren as President of the Provincial Congress. James was no close relation to Joseph. He was married to Mercy Otis Warren, the sister of the famous James Otis. The man who had played such a large role over many years in the events leading to the fighting in Boston. The British guards on Charlestown Neck, eventually put up artillery to prevent any attempted counter attack. The provincials fortified entrenchments between the Neck and Cambridge, to stem another British assault. 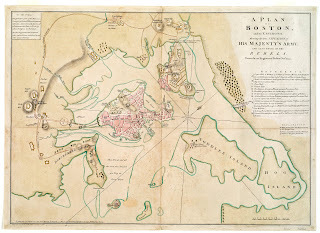 They also fortified their defenses in Roxbury, still expecting a British attempt to take Dorchester Heights. Col. Gridley oversaw the new defenses, but received assistance from a new source, a Boston bookstore owner named Henry Knox. Knox had long been a Son of Liberty and active in pre-war Boston. Despite having no actual military experience, Knox had read all about military engineering and artillery. He was ready to put his learning to work. 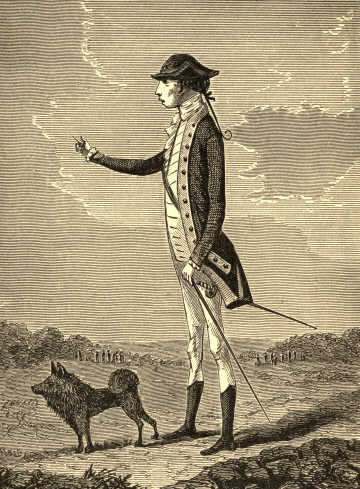 On the British side, General Gage had decided against any further assaults for now. Both armies buried their dead and treated their wounded, a larger percentage of which would die over the next few weeks, given the state of military medicine. Many British officers blamed their defeat on the poor performance of the regulars. That poor performance, many argued, reflected poor training and drill, which in turn reflected on the officers. 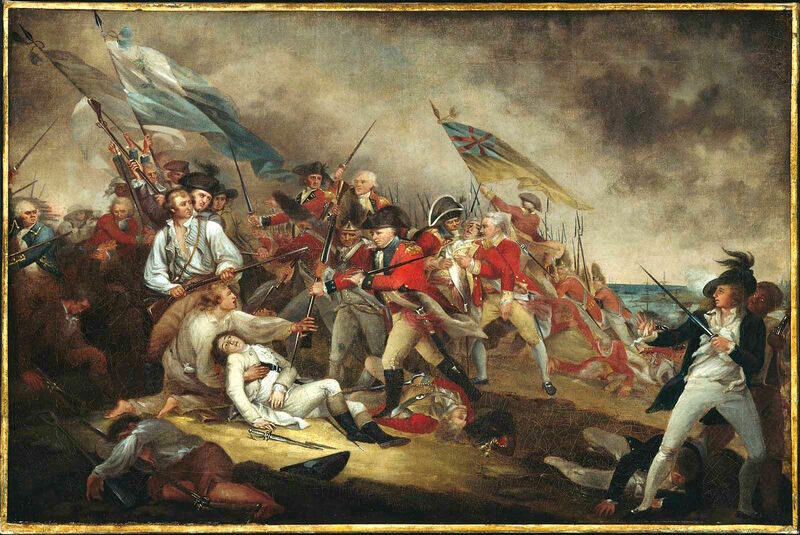 Ultimately, Gage was to blame and would lose his command as a result of the losses at Bunker Hill. But that decision was still months away. Instead, the American commander would be the next one replaced, when the Americans get a new Commander in Chief, General George Washington.